Daredevil is a second-tier Marvel hero, who hasn’t enjoyed the success or popularity of Spiderman or the X-Men, nor is he as integral to the universe as Iron Man or Captain America. First off he’s kind of hard to explain. He’s not a Norse God, or a man in a Iron Suit, or a Super Solder. He’s actually a blind guy. 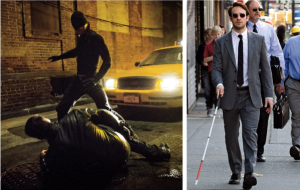 Matt Murdock was in an accident when he was young wherein toxic chemicals sprayed onto his eyes, leaving him blind. As time went by he began to realize that his other senses were heightened and that by focusing he had a sort-of sixth sense (there are actually more than five senses anyway as mentioned in the series, but that’s another blog entry) that works a lot like radar. So while he is still effectively blind, he can hear, smell, taste, and feel so well that he can detect specifics about the people on the floor above him, tell if someone is lying, and sense an attacker’s adrenaline pumping, giving him a near precognitive ability to sense attacks. In addition, his inner ear is also extremely balanced, making him very good at acrobatics and extremely agile. Matt’s father was a boxer in New York, where he grew up in the real-life neighborhood of Hell’s Kitchen, which despite the name, is actually now quite a pleasant place to live due to a number of re-gentrification movements that have taken place in the area since the creation of the character in the 60s. Anyway, Matt’s dad wasn’t a great boxer, but even if didn’t win many fights he was never beaten by a knock-out, only a TKO. “Battling Jack Murdock” was known for being able to take a beating and stay standing. Matt’s father refused to take the fall in a fight and was killed for his honesty. Shortly thereafter a man named “Stick” found Matt in an orphanage. Stick was a member of a group of blind martial artists, who believed that sight only offered distraction and used their enhanced senses to best their opponents. Stick became a father figure to young Matt Murdock and he trained him to hone his abilities. Matt, wanting to fight the kind of corruption and injustice that led to his father’s death, decided that he wanted to become a lawyer to stand up for the little guy. He wanted to stay in his neighborhood and with the help of his business partner and friend, Foggy Nelson, he started the Nelson and Murdock law firm. 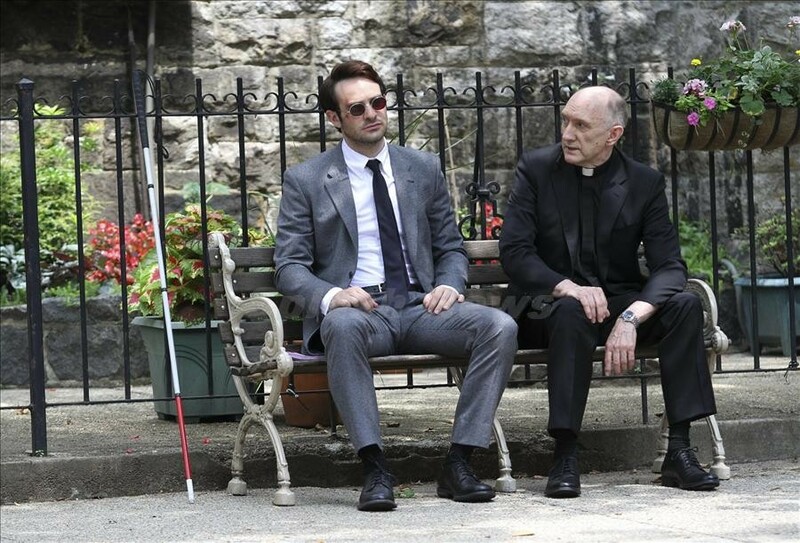 Any description of the character of Matt Murdock would not be complete without a discussion of his faith. While many superheros are vaguely protestant (Superman is Methodist, as specified in action comics #850) Daredevil’s Christian, Catholic faith is a foundational part of his character. It’s no mistake that both this new version of Daredevil and the 2003 Movie have early scenes of him in confessional. So there you have it. Lawyer by day, Superhero by night, blind all the time, and fundamentally Catholic. I’ve already been berated by fan-boys who loved the series immediately for having a less-than stellar opinion of the new series. That isn’t to say that I don’t think it is very good, but I do feel that I need to say that I was disappointed in one major way. This is the third TV series in the already enormous Marvel cinematic universe that includes all the characters in the eight various Avengers films, Guardians of the Galaxy, Agents of SHIELD, Agent Carter, as well as the upcoming Ant Man, Black Panther, Doctor Strange, and Inhumans films in addition to the pending Jessica Jones, Defenders, and Luke Cage Netflix series. Up to this point all of the films and TV series have had the same sensibility; they don’t take themselves too seriously and they have fun. Humor is a huge element in all of the Marvel films up to this point, and even in the Agents of SHIELD television show. The violence in these films has always had a measure of un-reality to it that gave it the feel of a comic book movie; so no matter if the world or galaxy is in danger, the stakes are low and the fun is high. Daredevil is the first to break from this world which bothers me on two levels: I personally prefer the “fun” over the realistic. If I wanted realism, I’d live my life. More bothersome than that, however is that this is actually a problem for the cinematic universe. 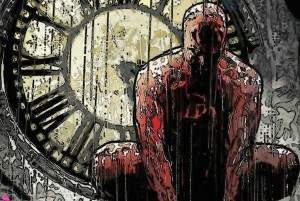 The reality presented in Daredevil is totally inconsistent with the rest of the world it proposes to be in. Some will not be bothered by this, but it upsets me because it marks the end of the continuity that has been so great within the MCU up to this point. What is the difference? Well Daredevil is trying to reach out to fans of HBO series by having a show with the kind of extreme violence you’d expect from an R-rated film. Things like characters impaling themselves on rusty fence posts, a bad guy beheading someone with a car door, a guy’s head getting crushed with a bowling ball, and lots of cuts, and punches that draw blood like a Tarantino film. This is one of the most violent TV show’s I’ve watched. I’m certain that the production team had a tanker of fake blood ordered for this season. Every opportunity they get, someone is bleeding from the mouth. Every time someone punches someone, they have to do it twice as much as they usually do. A friend pointed out the Foley effects, that is the sound effects that relate to humans, is louder and more visceral. The enhanced sounds make the hits seem harder, the cracking of bones and spurting of blood all the more agonizing. I wonder if part of this was to put us in Matt Murdock’s shoes, who perceives the world based more on sound than the visual. Yes, fans of the comic tell me that this level of violence is consistent with the comics, but I would argue that reading a comic with cartoon-depicted fights cannot ever reach the same level of visceral impact that watching a bloody fistfight happen on screen between real people. Red ink is very different from looking at a person covered in what appears to be real bloo as it seeps out of their mouths and from wounds all over their bodies. I was still hoping for an interpretation of Daredevil that didn’t take the darker tones, but had that lightheartedness that we get from Iron Man or Guardians. As such this is NOT for children. I wouldn’t have much of a problem watching the Avengers, or Agents of Shield with a ten-year-old, I wouldn’t suggest this for kids younger than 15. It is very intense and not just because of the violence. The entire world is bleak. The bad guy is also more complex and at points, seems arguably more sympathetic than the “hero.” Also, this probably won’t entertain kids. There were many moments where it wasn’t very entertaining to me. Between the extreme violence there are many long scenes where characters are talking, often in other languages – requiring me to read subtitles, and offering the very serious dialogue that sometimes makes me feel like I’m watching an episode of law and order rather than a show about a superhero. There’s almost two full episodes where Matt is sitting on the couch after a particularly bad beating, during which there is little-to-no action. I’m all for character development, but I’m watching an action/adventure series here. Even some of the more action-packed scenes can get a little boring; there’s an entire episode where Matt is trapped in a building with someone he’s trying to get information from. There’s another one where the only action sequence takes place at the end of the plot, so they break it up across the episode, which only makes for really disjointed storytelling. 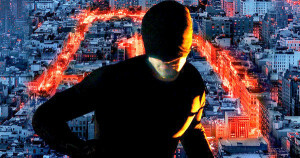 Matt Murdock as “The Masked Man” in this first season he doesn’t dawn the familiar red costume until the last episode. The likability of the characters is occasionally an issue in this series as well. Most of the characters a likable, but also a little annoying. There’s no one that you look at and feel like they’re someone you really enjoy watching all the time. Matt is generally likeable, though we go through periods of time where you question his logic (instead of getting the dying dirty cop to give you “information” about his boss, why not get a confession on record?) Foggy is likable most of the time, but there are times where his not knowing Matt’s secret identity really makes him a frustratingly ignorant voice. Also he has some lines that are clearly intended to be humorous that don’t quite land. Karen is likable except you don’t really understand why she doesn’t feel free to tell Foggy and Matt what she’s up to in the background, as she investigates with Ben, the reporter. Ben is a likable character, but it’s questionable that we need him in the story. He’s one of a handful of characters that make the whole thing feel like there are a few-too-many characters in the series. Or, at least that they’re trying too hard to check in with all of them regularly. This may seem like a something peripheral to Christianity, but it is very important. Today’s popular philosophy is to destroy or at lest stridently discount any notion of the existence of absolute evil. In the church it often takes the form of rewriting the intentions of scripture by discounting the many great theologians that have come before us, and acting as if we know better today. It shows that priest realizing that the collections of references to an enemy weren’t made into one person, but rather they were discovered to have been referring to the same person. It actually discusses an important theological topic on a popular TV show with reasonable respect for Christian orthodoxy. The Priest isn’t the only one discussing matters of faith. Throughout the series Matt brings up God, God’s will, and God’s gifts. While he is often frustrated or even angry with God, he trusts and believes in Him. It’s a constant and very real tension that Matt believes his gifts are from God, but struggles with knowing how to use them, and what God’s will is. He also prays and makes the sign of the cross before putting his outfit on. What’s more is that the bad guy, Wilson Fisk, AKA “The Kingpin” states two different times that he is not a man of faith. The second time he makes this assertion is toward the end of the last episode wherein he then tells the story of the good Samaritan, explaining that he used to believe he was the the good Samaritan, but now he realizes that he is “the ill-intent” who attacked the man on the road that day. Murdock and Fisk have similar back-stories, as we see, but one became the enemy he was trying the fight and carries guilt with him everywhere, and the other humbly protects people from the shadows. We’re offered the possibility that the primary difference between the two is their faith. There is a real sense in which this is not a superhero series at all. Similar to “The Dark Night” it’s a crime story, a detective story first. The scale is much smaller than what we see in most marvel films, as it takes place in one neighborhood on Manhattan. The small scale only adds to the grittiness of it. There’s a sense in which it’s about real world problems of drugs, human trafficking, gangs, politics, and corruption. This is another reason why I’m not a huge fan of the series. If I wanted these kinds of issues I could watch almost any police procedural. Some however have reacted to the opposite. Lost of guys really respond to the raw, dark realism. There is a very noir sensibility to it both in the flavor of the plot and in the way it is photographed. If you want to watch a series about a super hero, watch the Flash on the CW. It’s just a fun superhero TV show. This is not that at all. This is a painful walk through a very real world that is intended to make you stop and ponder right and wrong. It is also slower than many superhero shows, which I can’t decide if it is exacerbated by the fact that it’s available to watch all at once, or if that helps alleviate the problem. While many shows have bottle episodes, that is episodes that take place on established sets to save money, usually in the middle of the season and often taking place entirely in one room, there is a sense in which the whole season feels bottled when compared to the larger scale of other marvel movies. Even some of the more action packed episodes are cooped up in a single location. Is it a good show? Someone just asked me this question and I said “that’s a complicated question.” They then asked me if they would like it, and that is less complicated. If you like violent action, then you will like this series. If you like slow-burn plot where people in suits make veiled threats toward each other, then this is your series. If you don’t mind a large portion of the plot examining the life of the bad guy, you might like this series. If you don’t like the marvel movies up to this point, because they’re not real or gritty enough, I’d say give this one a try. If you liked Dark Knight, then you’ll probably like this one. If however, you don’t like seeing lots of blood you will probably not like this. If you want your plot to move quickly, straight forward to the resolution you won’t enjoy this. If you need a little more than a drop of comic relief, I’d say skip this one. If you get tired of long scenes where bad guys are talking to each other about subplots that will have no effect on the larger story then you won’t enjoy this show. If Captain America, Iron Man, or Guardians, rank among your favorite movies – this might be a bit much for you. If you thought “Dark Knight” was a bit too dark, then I don’t recommend this series. Is it a good show? Arguably, yes. But it’s not for families with kids. It’s not as broad-appeal as I believe the Avengers is, and it definitely isn’t aiming for the same audience. I’d be curious to see where they would take it in a second season, but the basically happy ending of this first season almost makes me wish they’d stop now and perhaps bring Daredevil into a few guest appearances of other Marvel shows. It definitely has a few fun moments though, if only in the last episode. So, if you’re into this kind of dark action, check it out – it has some good truth to it.